Download Dark UI Kit Components Free PSD. This UI Kit PSD is a set of beautiful free UI components which includes Edit Boxes Check Boxes Radio Buttons Page Navigation Menu Buttons and more. Use this UI Kit in any of your projects, and even learn with it, by examining each component to see how it is put together. Components are made in Adobe Photoshop (PSD) using Shape Layers (Vector Elements). Therefore, you can increase or decrease the size of each element without any loss of image quality. This kit includes lots of buttons, dials and sliders to get you started with creating mockups for your first mobile or desktop application GUI. Everything in this PSD is made with Vector Shapes and can be scaled without the loss of quality and itÍs free for commercial use!. You will find this Dark UI Kit Components Free PSD useful and can use it to concept ideas or create custom interface elements. The best thing about this Free Dark UI Kit Components PSD is that you can download it for free and its easy to use and can be customized according to your needs. So download this Dark UI Kit Components Free PSD and check them out. Dark UI Kit Components PSD is just perfect and a great resource for any type of personal or commercial Web and mobile UI design projects. Dark UI Kit Components made in photoshop PSD file format. Elements are organized in layers, allows you for editing of files quickly. 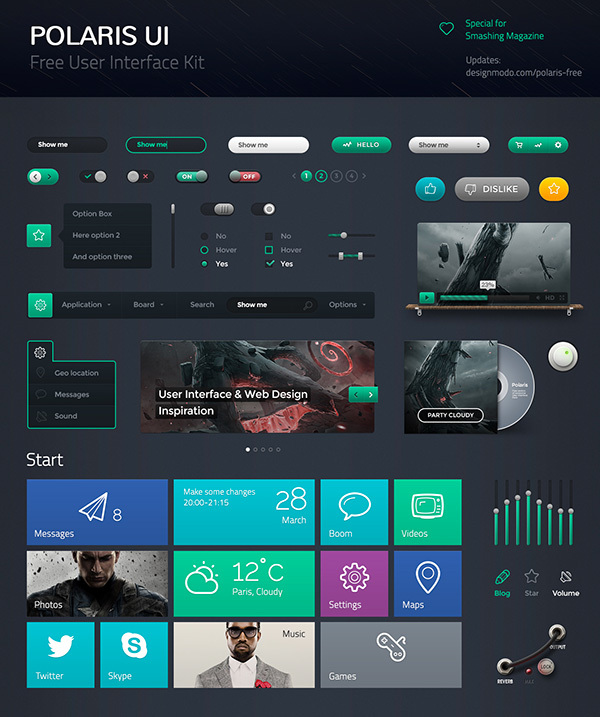 Hope you like this Dark UI Kit Components Free PSD. Enjoy!